An economical, meatfirst beef base with no added MSG that adds robust beef flavor to any dish. Legout shelf-stable bases offer high quality at a great value, with no added MSG varieties, hearty flavors, great flexibility and versatility, no trans fat varieties, and gluten-free varieties. 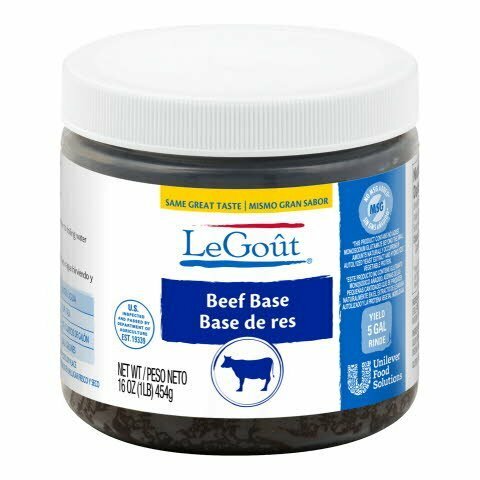 BEEF SOUP: Add the contents of this container to 5 gallons of boiling water, and serve. For smaller quantities add 4 ounces, or 1/2 measuring cup, to 5 quarts of boiling water. For individual servings add 1 teaspoon to 1 measuring cup of boiling water. Add other ingredients as desired. OTHER SOUPS: To soup prepared as above, add desired amount of cooked vegetables, cooked barley or well drained, cooked egg noodles. An economical, meat-first beef base with no added MSG that adds robust beef flavor to any dish.